Whenever I’m in the Petrie Museum I’m always drawn to the jewellery. This is because a) much like a magpie my attention is easily attracted to shiny pretty objects, and b) I would actually wear a lot of the pieces on display, probably to some future fancy event that I’ll one day attend post PhD life. So I decided to do a little research on the history of jewellery in ancient Egypt and pick out my favourite pieces from the collection. As far back as the Stone Age, our ancestors have been decorating themselves in jewellery. Originally these were just simple pieces crafted from easily available resources such as seashells, bone and animal skins. However, the ancient Egyptians had other ideas, and they would go on to create trends and styles of jewellery that would live on to this day. The discovery of gold in ancient Egypt, along with the use of precious gems, resulted in the creation of highly lavish jewellery pieces that epitomised the luxury culture of nobles and royals. As technology advanced and materials became more readily available, the popularity and extravagance of jewellery also increased, making it one of the most desirable trade items of the ancient world. Jewellery was extremely popular in ancient Egypt. Everyone wore it, whether they were male, female, rich or poor. But jewellery was not just about adorning oneself with pretty gems; it also acted as symbol of status and was steeped in religious beliefs. 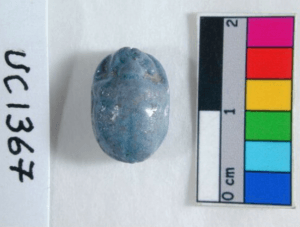 Small charms, known as amulets, were of particular religious importance to ancient Egyptians. They believed that these charms had magical powers of protection and healing, and would bestow good fortune to the wearer. 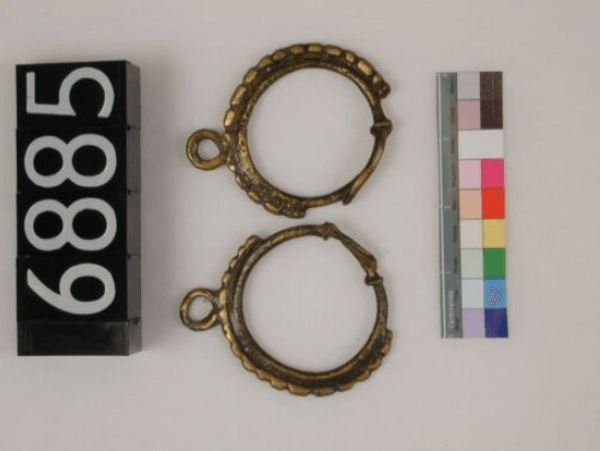 Much like charm bracelets today, these charms were commonly worn as part of a necklace or bracelet, and the shape or symbol of the amulet would specify a particular meaning or power. Jewellery offered magical powers to the dead as well as the living, and ancient Egyptians were often buried wearing their prized jewels. One of the most common amulets to be buried with was the scarab, as it symbolised rebirth and would ensure reincarnation to the next level. The materials that a jewellery piece was made out of acted as an indicator for social class. Nobles would wear jewellery made up of gold and precious gems, and others would wear jewellery made from copper, colourful stones and rocks. Gold was the most commonly used precious metal, due to its availability in Egypt at the time and its softness, which made it the perfect material for establishing elaborate intricate designs. Moreover, the non-tarnishing properties of gold added to the magical prowess of the metal, leading ancient Egyptians to believe that it was the ‘flesh of the gods’. Another regularly used material was the semi-precious stone Lapis Lazuli. The deep blue colour of Lapis Lazuli symbolised honour, royalty, wisdom and truth. Other prized stones included obsidian, garnet, rock crystal and carnelian, pearls and emeralds. However, artificial more affordable versions of these precious gems were also crafted, and commonly worn by the lower classes. Much like the fake diamonds and pearls of today, these artificial gemstones were practically indistinguishable from the real thing. So now we’ve had a little history. Lets get on to the important stuff – which pieces of jewellery I would most like to wear! First, lets start with the earrings. It wasn’t actually until King Tutankhamen that earrings became a popular jewellery item among ancient Egyptians. The style and use of earrings is likely to have been brought over from western Africa. My favourite earrings are these beautiful hoops, which would not look out of place on stall in a Brick Lane market! Another piece that would nicely fit into my jewellery collection is a string of faience cat amulets. Firstly, it will go brilliantly with all my other cat jewellery. Secondly, cats were highly regarded in ancient Egypt and these cat amulets would likely to have been of great importance to the owner. 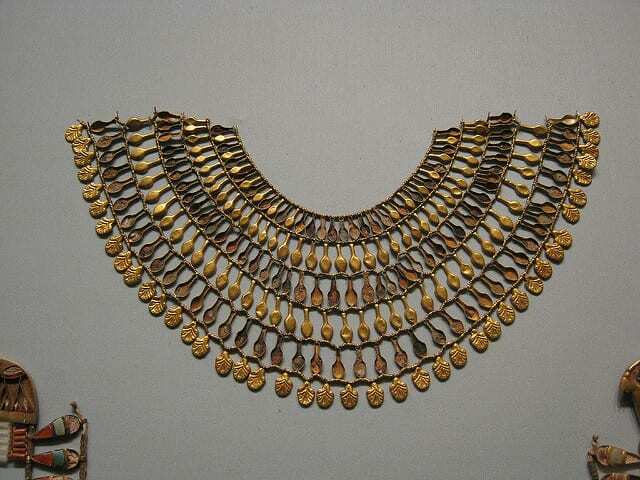 Finally, the ultimate extravagant piece from the collection that I would love to own, is this wide collar necklace, which was likely to have been worn by Akhenaten, Tutankhamen’s father. 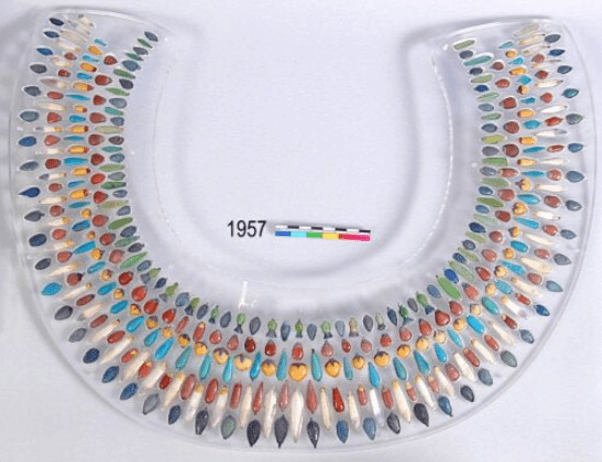 Each bead was excavated separately and the design of the necklace was reconstructed for the Petrie collection. Additionally, conservation revealed a turquoise bead (11th from the right) to have a cartouche of Tutankhamun. When you’re next in the Petrie, see if you can spot it! Are emojis the hieroglyphics of the 21st century? Emojis are everywhere. Whether they’re all over your social media, on advertisements on the tube, or adorning t-shirts and bags in Primark, you just can’t escape them! A recent survey by TalkTalk revealed that 72% of 18-25 year olds find it easier when texting to express themselves with emojis rather than using the written word. And it’s not just millenials who have been affected – even my Mum can’t send me a text without including one. But this is not the first time pictorial images have been used as a form of written communication. During a recent shift in the Petrie museum, I realised that many of the hieroglyphic carvings on display held a strong resemblance to an emoji-filled text I had sent earlier that day; this left me wondering what the similarities are between the two languages. Are emojis a step forwards in how we communicate or are we reverting back to the language of the ancient Egyptians? Hieroglyphics are considered to be one of the oldest forms of written language, with the earliest known form dating back to 3300-3200BC. The term hieroglyphics was coined by the ancient Greeks to describe the ‘sacred carvings’ they observed on Egyptian monuments. In ancient Egyptian the word for hieroglyphics translates to mean ‘the word of the gods’, highlighting its importance in Egyptian culture. Unlike emojis, which are used by more than 90% of the world’s online population, only a small percentage of Ancient Egyptians were taught how to write hieroglyphics, such as priests, royals and civil officials. Consequently, hieroglyphics were predominantly confined to religious texts, royal documents and the recording of historical events. Over time, the use of hieroglyphics became more widespread in Egyptian civilization; this resulted in a simplified cursive form of the script, known as hieratic being developed. Despite hieroglyphics being the language most commonly associated with Ancient Egypt, hieratic was actually used for the bulk of written texts. Hieratic was simplified even further into demotic scripture in 7th century BC. Thereafter, hieroglyphics were primarily used for inscriptions on buildings, and as a form of decorative writing on furniture and jewellery. Use of hieroglyphics declined rapidly in Egypt under Roman rule and their meaning was lost for almost 2,000 years until the rediscovery of the Rosetta Stone in 1799. 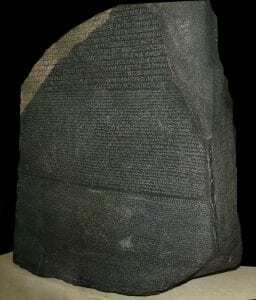 The Rosetta stone was the missing key to deciphering hieroglyphics, as it was engraved with a text written in three different ways: hieroglyphics, ancient Greek and demotic script. The French scholar Jean-Francoise Champillion used the Rosetta stone, alongside the work of other European scholars, to decipher the hieroglyphs and unlocked the language of the Ancient Egyptians once more. 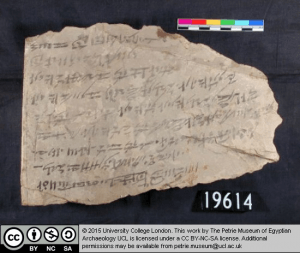 Work deciphering the different written texts of Ancient Egypt is still ongoing. UCL’s Papyrus for the People Project aims to improve our understanding of the collection of written texts at the Petrie Museum and make them more accessible to the general public. You can read more about the project here. 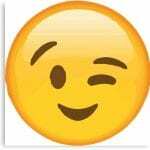 The term emoji originates from the Japanese for pictograph: e “picture” + moji “character”. Emojis are classified as a pictographic and ideographic writing system that uses symbols to represent an object or an idea rather than specific words. Although at first glance hieroglyphics may also appear to function in a similar way, the language is actually far more layered and complex. Hieroglyphics are comprised of phonograms which represent sounds, logograms which represent words or phrases, and determinatives which are used at the end to clarify meaning of the word. Hieroglyphic characters can also have multiple meanings depending on how they are used. For example the symbol for ‘house’, which was pronounced as pr, can also be used phonetically to represent the sound ‘pr’ in other words. Combinations of hieroglyphics characters could therefore be used to spell out larger words and composite phrases. According to a journalist at the Guardian, emojis are an evolutionary step back, a return to the ‘static culture’ of ancient Egypt that was limited by its use of hieroglyphs. However, the hieroglyphics language was far more than ‘picture writing’. 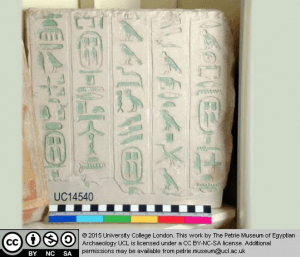 It allowed ancient Egyptians to compose a huge variety of texts from medical documents to poetry – texts that are significantly more advanced than what is possible to convey with emojis. Let’s just say if my doctor tried to write my medical report purely in emojis I would be concerned! Emojis are a great form of communication and can add a creative flair to how we message one another. However, they will never be a replacement for the written word and I doubt they would have the capacity to help build and maintain an entire civilisation. If I change my mind and decide to write my thesis in emoji, I’ll let you know! If a salamander can grow back a limb, why can’t I? Regeneration has been the deemed the “Holy Grail” of scientific and medical research: the ability to regrow a limb, replace damaged tissue and heal without scars would completely change the face of modern medicine. Whilst regeneration, on a large scale, still precludes us Homo sapiens, other members of the animal kingdom are light years ahead. Not wanting to completely disregard humans, it is important so say that we are capable of a small degree of regeneration. We can heal the upper layer of our skin without scarring, regenerate parts of our gut lining, expand our liver to replace damaged parts, and can even regenerate the very tips of our fingers. 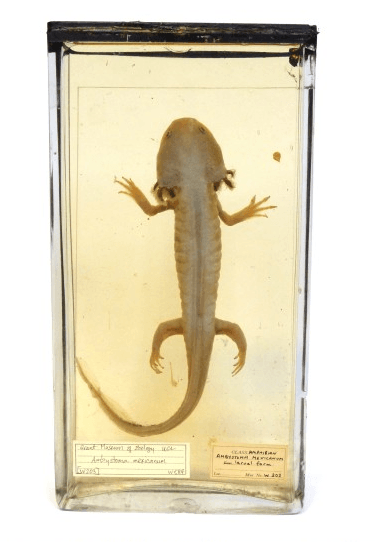 However, if you go to the far left corner of the Grant museum you will come face to face with an axolotl salamander, whose regenerative powers are worthy of a science fiction character. Like many salamander species, the axolotl has the remarkable ability of re-growing lost limbs. An axolotl’s leg can be amputated hundreds of times and it will continue to grow back perfectly! However, what makes axolotls so unique is that as well as regenerating their limbs they can also regenerate their jaw, tail, heart and spinal cord, all without scarring. 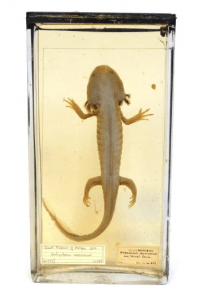 If you want to find out more about the extraordinary features of the axolotl, read this post from the Grant Museums’ Specimen of the Week blog. To recreate the limb the axolotl, and other salamander species, need to be able to regrow everything – bone, muscle, blood vessels, nerves – and all of this needs to be built from scratch. So, how do they do this? Despite our understanding the basic steps of regeneration, the intricacies of each step are extremely complicated and a lot of questions still remain unanswered. Imagine having to reconstruct an entirely new building from previously used disassembled building materials, without any blueprint or instructions. How would you know what to make and where each building material goes? This is the exact dilemma facing the cells of the regenerating limb, and how exactly they overcome this hurdle continues to puzzle scientists. OK there are a lot of complex mechanisms involved – but surely if a simple salamander can regrow a limb we should be able to as well? Well actually our increased complexity could be what’s stopping us from regenerating. All our cell behaviours need to be tightly regulated in order to maintain the function of our complex organ systems and prevent aberrant growth. If cells are reverted back to their immature state they will be more difficult to control and thus more likely to misbehave, which could result in the formation of a tumour or loss of organ function. 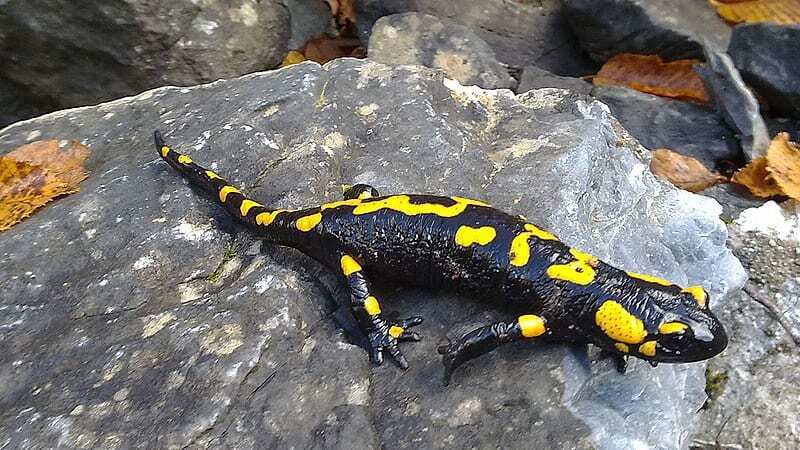 With less complex animals, such as the salamander, these misbehaving cells are unlikely to inflict as much damage and cause as much of a problem. Some researchers have proposed that we have the capacity to regenerate but, for unknown reasons, this mechanism was switched off during evolution. The theory is that if our genetic code allowed us to develop entire limbs and structures in the womb, then that information must still exist inside of us. It could be as simple as switching on a few genes and – hey presto – you’ve built yourself a limb! Furthermore, recent discoveries have identified genes involved in the regeneration process of the axolotl that are turned off in humans. 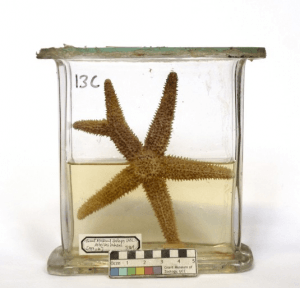 Could these hold the key to regeneration? Another theory is that it is easier for amphibians to regenerate, as they are cold blooded and therefore have fewer metabolic requirements. A salamander can hide away for months without eating, waiting for their limb to grow back. However, this would be a death sentence for mammals that would need to heal much faster in order to keep up with their metabolic demands. Moreover, the regeneration time of the axolotl is far from rapid, if humans were to regenerate at the same rate it would take up to 15-20 years to regrow a full limb! Therefore, alternative medical interventions are likely to provide a more pragmatic solution. The axolotl and other salamanders are not the only animals that can regenerate. Hydras, starfish, flat worms, zebrafish, and even the African spiny mouse all have the capacity to regenerate themselves to a certain degree. So next time you encounter one of these creatures whilst exploring the Grant Museum, remember that although they may look simple these animals have science fiction powers that, right now, humans can only dream about. Should human remains be displayed in museums? If you have ever visited the Petrie Museum you are unlikely to have missed the man buried in a pot. In the past the pragmatic scientist in me had just regarded this as a skeleton in a pot; spending most of my time studying it to see how many of the different human bones I could still name from my undergraduate anatomy class (not that many it turns out!). However, a group of visiting American college students made me think about it differently. They were discussing the use of human remains in museum collections, their purpose, and the importance of displaying them respectfully. This opened up an interesting debate: how should human remains be displayed and should they even be displayed at all? In the past human remains were regularly collected from excavation sites and displayed in museum cases with little thought put into the person that they once were. However, feelings towards the use of human remains in the UK have begun to change in recent years. 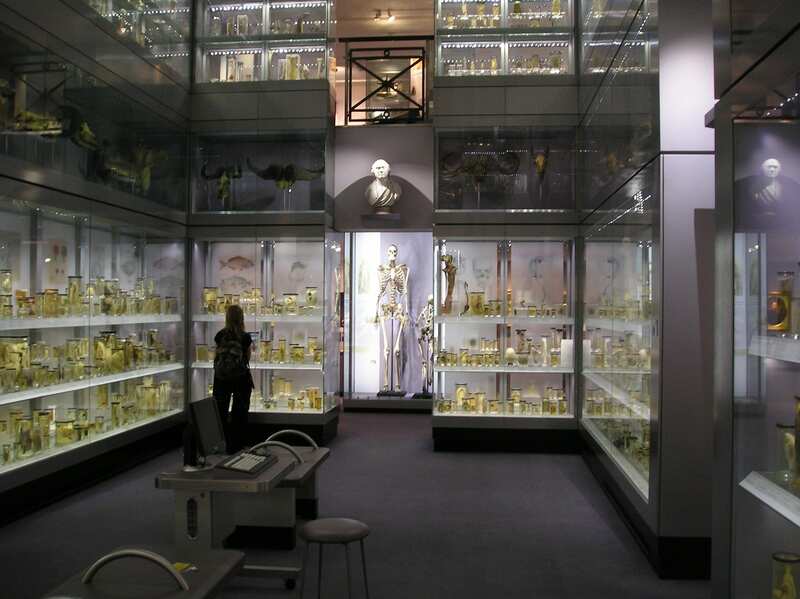 In 2005 the Department for Culture, Media and Sport (DCMS) released a “Guidance for the Care of Human Remains in Museums” outlining a code of practice for the handling and displaying of human remains. Consequently, human remains have been given a unique status within collections and are no longer treated as objects. Repatriation of human remains has also become more common with many indigenous communities requesting the return of their ancestors. Since 1996 both the UK and Australian governments have been committed to the return of indigenous remains to Australia and New Zealand. Over 1000 remains have been returned including 13 skulls and one limb, which were repatriated from UCL in 2007. A display that has caused a large amount of controversy is the skeleton of “The Irish Giant” Charles Byrne. To avoid being dissected and used for medical research, Charles Byrne requested to be buried at sea. His request was ignored and his skeleton currently resides in a cabinet at the Huntarian Museum. Many have advocated for the return of his bones from the Huntarian allowing his burial wishes to be fulfilled. The Huntarian Museum, however, claim there is no direct evidence of his burial wishes and the educational benefits he provides to living and future generations of visitors is of greater value. This brings up another important question: Does the educational benefit of human remains outweigh the rights of the dead? Human remains are an important teaching tool for anthropology and archaeology and are vital to the study of medical sciences. Use of human remains in exhibitions can also greatly stimulate a learning experience, allowing a much stronger connection to the culture that is being represented. A survey by English Heritage showed that only 9% of people opposed the display of human bones in museums suggesting there is still high demand for public display of human remains in museums. However, museums must be careful to utilise human remains in an appropriate context in order to educate rather than just to attract audiences. Many people do not consider the ethical issues of how the dead should be displayed in a collection until they are asked: what if that was your grandfather or great-great grandmother? Would you still consider this respectful? 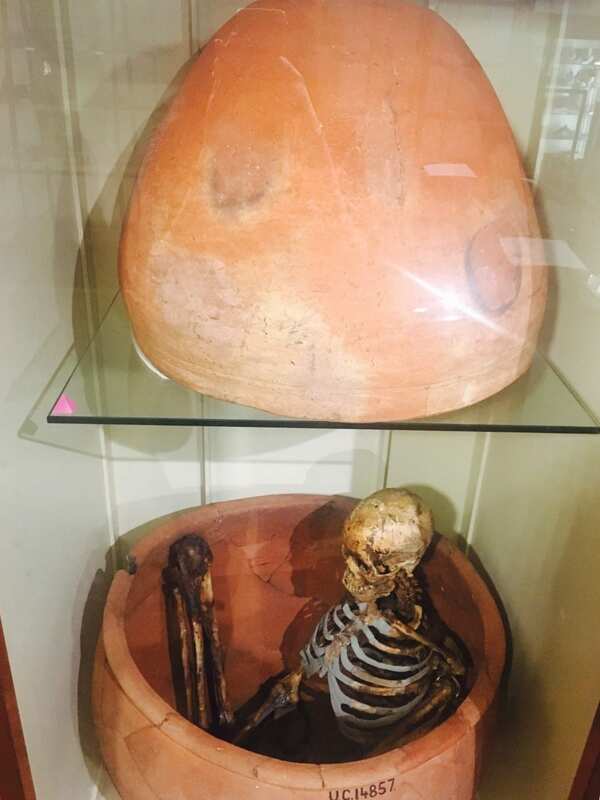 However, for many of the ancient human remains collected, including the man buried in the pot, their ancestry has been lost and we cannot know how their descendants, or they themselves, would feel about how their body is being used in the name of education. Although admittedly it is hard to argue that this is what the ancient Egyptians would have wanted. In our current legal system we rely on our family and loved ones to carry out our burial wishes. But in their absence we too would have no control over this, much like the ancient Egyptians on display. I’m not sure I would be willing for my skeleton to be used to educate future generation about the irreversible impact mobile phones had on our postures and spines (I’m imagining my skeleton hunched over my iPhone whilst scrolling through Instagram). But others might feel differently. As attitudes towards the displaying of human remains change, museum’s policies will have to adapt. Maybe in the future forms of consent will be required, similar to signing up for organ donation. But how many people will actually be willing to donate their bodies to museums? I guess only time will tell.